Baby Jade is getting so big and is so cute. School here is out on June 9th and I can't wait! I think the teachers get more excited about summer break than the kids do. I'm doing laundry and a little sewing tonight. It's been thundering off and on all afternoon but I haven't seen any rain yet. That's about it for me, have a great evening. Hi everyone! Welcome Tampa Doll ! Baby Jade is doing really good, getting so big. How precious is Baby Jade. I found a graph for a c2c with a dragon on it. Infact, this person has the Chinese Zodiac on the graphs. One graph per c2c. Now I hope to do one of these and I hope I can get help when I start this afghan. Computer going off, as the Hockey game is starting soon. 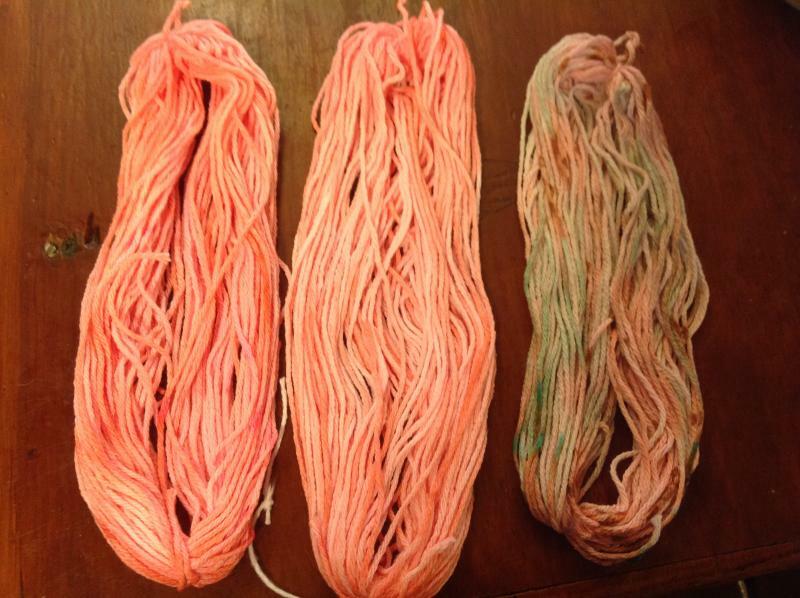 I'm just using Peaches n creme white cotton yarn. 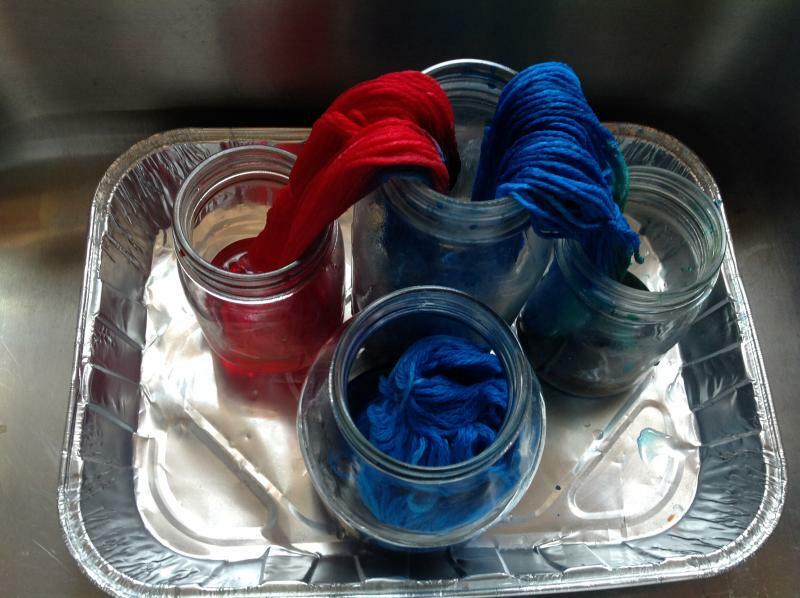 For the dye using the TIE DYE Create Basics Kit. I had a few of the colors for when we did t-shirts. I do have some wool yarn going to do next with the same DYE. I'll let you know. The first batch I used Kool Aid. Nope didn't work well for me on the cotton yarn. 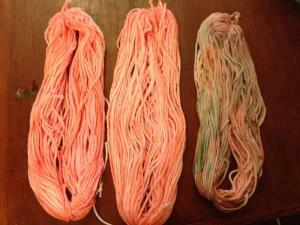 Maybe I'm using the wrong yarn. But I'm using what I have. Baby Jade is so cute and yep growing fast. She is so darling. The first picture is with the kool aid . Second and third picture is with the CreateBasics Kit Tye Dye. I'll leave them in the dye till about 4 tomorrow after noon. I have a few other colors I haven't taken pictures yet. Lol thats a perfect way to look at it Linda!! Owlvamp I agree with pineknott that blue is pretty. 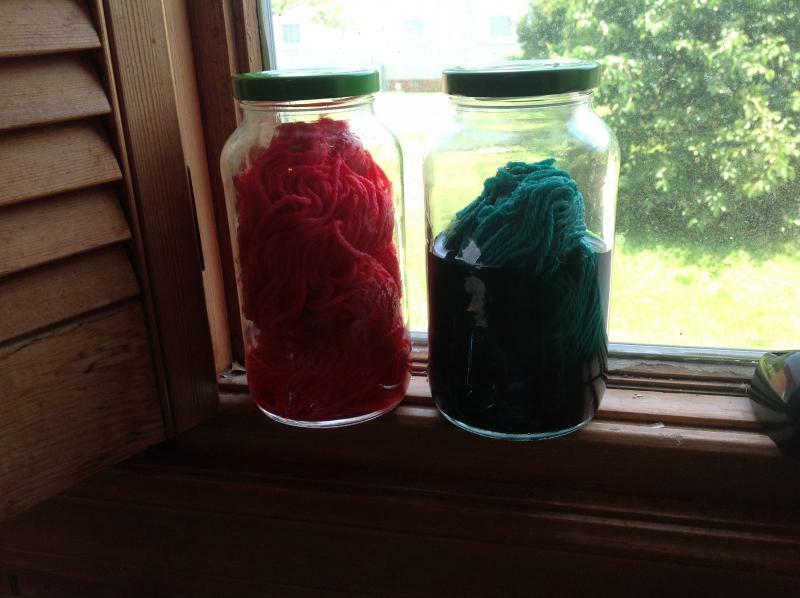 It looks like you are a pro at dying yarn. I could ne er under tke that !! Ill just stick with buying the color I need thankyou. BUt looks like sandra has it down pat. And look at that little baby. Shes adorable. Coyotee. The name is was The Villian. Dont know if you can even en find a copy anymore of it. MY daughter found my dvd on line. I had seen it years ago on old movie channel and really liked it. So does she. We dont too often agee on movies. The last one was Nebraska we both liked that one too!! HAppy Hockey Tampa hope you team wins. I love fiddling with a bunch of different things. Hi all! I finally made it! I have been using my tablet for a long time now for this, and my "security system" refused to let me click the link, telling me it was a scam...I sent a crabby feedback email and had to find the new thread the old fashioned way but yay me! I'm finally here! On another note, I almost have my 'ghan done! About 17 ish more rounds to go! So excited!!! I'm looking for a bumble bee afghan pattern. Does any one have one? Sandra check your e-mail. I may have what you are looking for. Hockey team lost Alls they needed was one game. Well they can try again tomorrow. This thread really gets busy. It is nice to see so much activity on one thread. off to a slow start,after going to bed around 1 am,not my usual time for bed,makes me so sluggish. pineknott enjoy that sunshine. Its another cloudy wet day here with chances of severe weather. Sorry to hear son in law is not doing very well. Katiebug glad to see you found us. Mary Jo sorry about your hockey team. Maybe they will win tonight. Katy I dont remember that movie. We have a couple of local stations that play old movies so I will keep my eye out for it. The ones I mentioned with the mixing animation with live actors are all Disney movies. 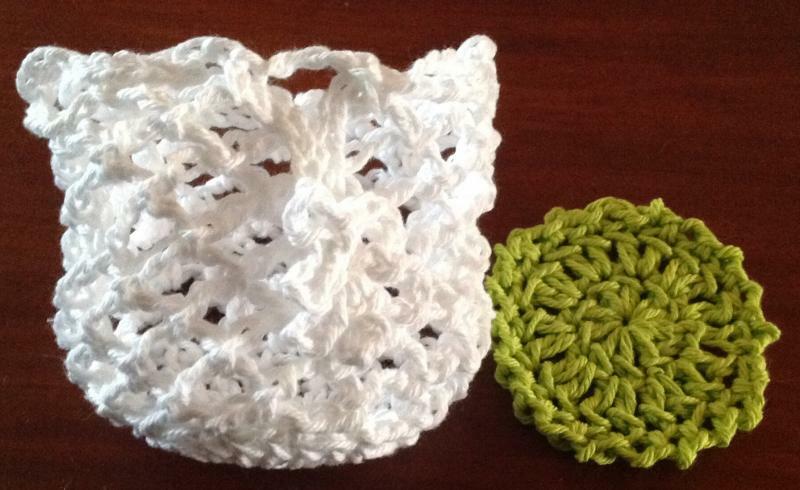 This is the bag I envisioned with the facial scrubbies. It's was very simple to make up and it's so darn cute. The facial Scrubbie I just winged it as well. What do you think? 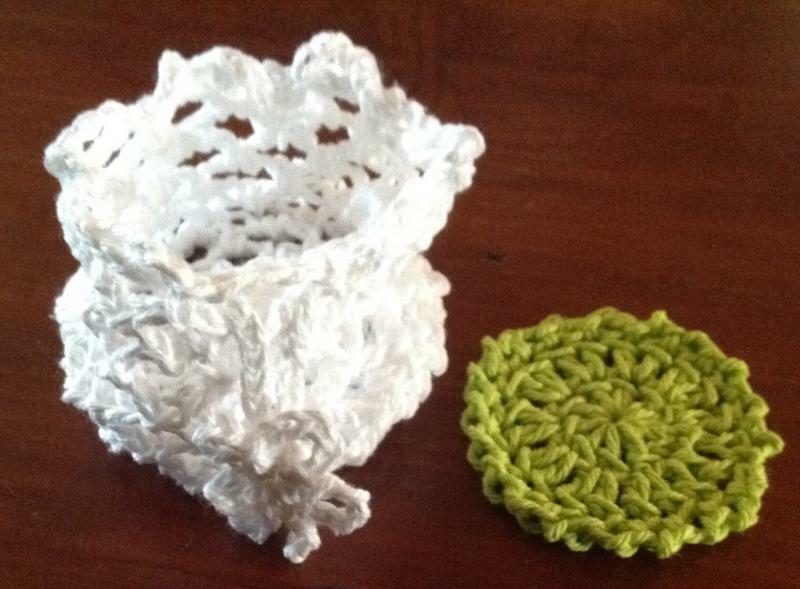 I was asked to put some things in a craft fair so was thinking about putting these sets in. The facial scrubbies and bag for $8.00. 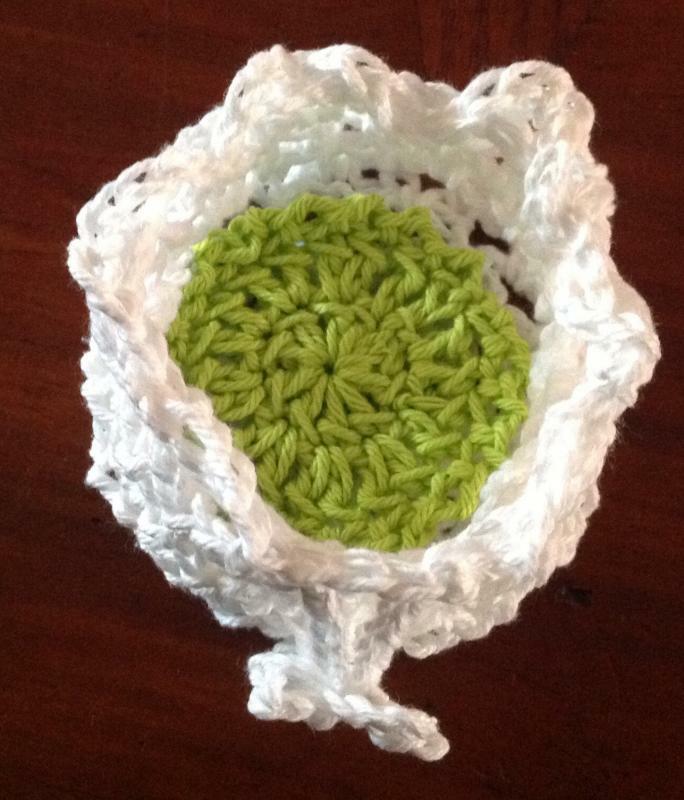 It will have about 5 scrubbies in it. 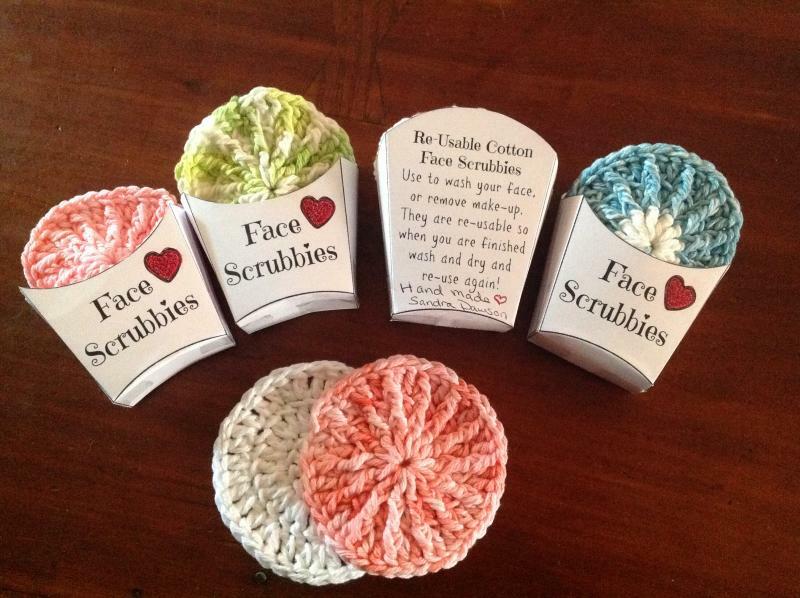 Then the other will have 4 face scrubbies they are a little bigger $6.00. Do you think the prices are alright. The other person is selling ( forgot the name of it)Feet scrub past and lip exfoliating stuff. So I thought scrubbies would go a long with what she is doing. I also have a few purses I sewed up to. John Deer, Dallas Cowboys, Pittsburgh Steelers and a basketball one. If I have time will look to see what fabric I have to make a few more. Wow those are darling owlvamp! Katie Bug welcome back lol glad you finally got in. Rained late night. Might be parlly coudy all day oh you are right Bgs i recognized-At some point i may have had them on at one time or another and. Went off todo other things so cant say i totally SAW them. Almost chilly here this am. I have a flannel wrap over my shoulders! So sorry about son in law linda. And i too didnt sleep well so am draggin my tail a bit as well. Maybe a full moon last night?? That some times brings a restless night for me. DOnt know what the day holds yet but i will check back in a bit latr. So sorry your team lost mary jo maybe tonight?? Good luck! Im off!! Enjoy your day. and the 21st. So that wasnt it! Lawn tractor is back BUT it came back with the hood cracked and its a pretty expensive piece of John Deere plastic as we have replaced it once ourselves. The guy called the shop and they were trying to figure it all out as they had to order the piece. I told them if they could just get the piece in (and them pay for the piece) we could pick it up and put it on ourself. Didnt want them hauling it back and sitting there waiting for the piece when we could be mowing with it. I told the guy that we are careful with it and there are tabs on each side you release to lift the hood. The guy said someone in the shop must have just grabbed to pull it up and not released the tabs. I am glad I noticed before he drove off and that they didnt argue about replacing it. Katy Petes Dragon is about a lightkeepers (Mickey Rooney) daughter (Helen Reddy) who befriends a runaway orphan who has a big green animated dragon called Elliot for a friend. Bedknobs and Broomsticks starred Angela Landsbury ( from Murder She Wrote) as amateur witch who along with three children save England fom an invasion during ww2. Looks like they are releasing a new version of Petes Dragon this Aug. I heard fro Snowbear. She is laid up for a few days due to a nasty spider bite. Sqhe will be back ina couple days.